As a triathlete, the reason you need to assess your functional movement (flexibility, joint mobility, and stability) is to improve performance as a result of achieving better technique, because you can move better and reduce recurring injuries caused by misaligned or compensating movements. Triathlon is a cadenced endurance sport requiring hundreds of thousands, if not millions, of movement repetitions in the extremities and torso. As you train, you experience ongoing stages of movement, adaptation, and skill learning as you progress toward advances in technique and fitness. How we walk, sit, stand, and carry our posture during daily activities affects how we move in our sport. It is especially important to learn how to move from the inside to outside of the body. In Triathletes in Motion, Marc Evans and Jane Cappaert present state-of-the-art multilevel assessments for identifying and correcting asymmetries caused by limitations in mobility, flexibility, and stability. World-class analysis of techniques across the three events combined with functional exercise tests set a new standard for coaching individual technique. Traditionally the focus of triathlon is on volume, intensity, and training periodization—doing particular workouts during the months, weeks, and days leading up to a race. But what if you could improve performance without logging extra distance on the road or in the water? That is the promise of Triathletes in Motion: Assessing Movement for World-Class Technique and Performance. In this book, Marc Evans introduces the Evans Assessment Principle to make the case that every triathlon training regimen should start with the physical assessments of movement. By looking carefully at movements during these assessments, you can detect limitations to mobility, flexibility, strength, and stability. These limiters cannot be corrected by traditional technique instruction alone, so Evans presents specific exercises and tests that address each one. The results are greater efficiency, fewer injuries, and faster performances. Whether you are a veteran triathlete seeking a performance breakthrough, a newer triathlete starting the training season, or a coach or member of a triathlon federation searching for that edge, training should start with Triathletes in Motion. This resource includes hundreds of tests and exercises to help triathletes swim, cycle, and run faster and more economically. Marc Evans was triathlon’s first professional coach and has consulted, coached, collaborated with, and mentored some of the biggest names in the sport, including Dave Scott and Scott Tinley. His coauthor, Dr. Jane Cappaert, is a leading expert in sport biomechanics. Now they make their unique expertise available to everyone in Triathletes in Motion. 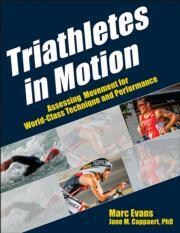 Note to purchasers of Triathletes in Motion (1st printing.) Figures 5.2 (page 167) 5.11 (p. 180), and 5.18 (p. 187) are incorrect. Human Kinetics regrets the error and any inconvenience it may have caused. You can determine if your copy is affected by clicking on the multimedia tab above. If your book displays the photo on pages 167, 180, and 187, then download the corrected pages here. Or, contact our customer service team at info@hkusa.com or call 1-800-747-4457 M-F 7-5 p.m. CST to request a corrected copy. Marc Evans has been inspiring excellence in endurance athletes and coaches since debuting as triathlon’s first professional coach in 1981. Triathletes in Motion, his fourth book, is his most comprehensive work to date and establishes a new standard for coaches and athletes with the Evans assessment principle by stressing the most important precept of coaching: individualization. Marc has developed more than 100 hours of credential-based coursework on movement and stability and 75 hours on technique. He is a respected resource for elite coaches and conducts movement assessment workshops and masters-level education clinics. Marc also has lectured at sport science conferences around the world. A two-time head coach for USA Triathlon, Marc led the elite 12-member team at the first World Championships in 1989 when Mark Allen won the gold medal for the United States. He was the head coach for the USA Triathlon performance testing at the Olympic Training Center and a founding member of USAT Coaching Commission. Additionally, he was the sports medicine conference coordinator and the director of endurance sports for the Ironman Sports and Endurance Center. Marc is also the inventor and co-holder of the patent for the Speedo Contoured and Speedo Swim Foil training paddles that have set the standard in swimming design for over a decade. He was presented with the Award of Excellence from the American Medical Association triathlon division and was named the International Coach of the Year. Marc lives in Boulder County, Colorado. Jane Cappaert, PhD, is a leading expert in the field of biomechanics. Cappaert began her career at the U.S. Olympic Training Center in Colorado Springs, Colorado. She initially analyzed the biomechanics of athletes competing in a variety of sports. She then spent nine years studying and improving the technique of swimmers and triathletes while working at USA Swimming. From 1997 to 2000, Cappaert designed, developed, tested, and patented Speedo International's first full-body swimsuit called FastSkin. During its debut at the 2000 Olympics in Sydney, swimmers wearing FastSkin suits won 83 percent of Olympic medals. After the 2000 Olympics, Cappaert took a position at Reebok International, where she led a team of engineers at Reebok's Human Performance Engineering Lab. While at Reebok, she engineered athletic shoes to meet the specific functional and biomechanical demands of running, power motions, cutting motions, and jumping.